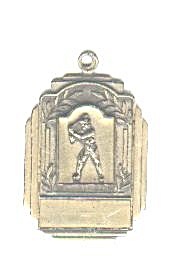 A silver colored medal with the front having a raised embossed figure of a baseball player getting ready to swing his bat. This is an older medal, but there is no date on it. 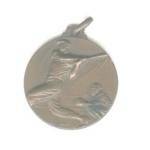 The back of the medal reads, Series D F. The medal measures ¾ in. by 1 1/8 in.